As Germany is the seventh largest country in Europe, it is no small task to explore the best parts of Deutschland, but with careful planning, visitors will have enough time to dive deep into the cities that meld a historic past with a modern, cosmopolitan sensibility. Discover the best time to go, routes and activities to experience Germany hospitality. Germany's weather is primarily temperate. Berlin's temperature, for example, is more moderate than you might expect, the lowest average low occurs in January at 26 degrees F. The highest high occurs in July and August at 73 degrees F. There is measurable precipitation (wet days) more than half the days of the year. Germany is a good place to go in summer, when Italy, France, and Spain swelter, but the best time to go to southern Germany is in the autumn when the wine is being harvested and there are festivals celebrating the season. Germany has a highly efficient train network, with the German National Railway, called Deutsche Bahn, providing easy transport to all major cities with stops in smaller towns along the way. While the high-speed train will get you to the next destination the fastest, regional trains provide a slower pace to take in the scenery and at a lower price. For travelers seeking to save a nights accommodation fee, an overnight train offers sleeping options that range from basic seats to luxury suites with a private bathroom. There are often specials on tickets, especially on weekends, which should be inquired about when purchasing a ticket at the station window. The country hosts multiple bus companies, like the Berlin Linien Bus and Flixbusbut, but they are not much much cheaper than the train. The bus lines offer comfy, modern coaches (some with free internet service) and cover all the main cities, however, unlike travel by train, the routes provide an option to visit smaller towns that do not host a train depot. Germany is justifiably proud of its autobahn—a high-speed highway network. The suggested speed limit in most clear areas is 130 km/hr, or roughly 80 mph and smaller roads are generally in good repair. As with all countries in Europe, Germany offers a wide array of options to spend the night from ultra-low-budget to luxury accommodations. Within a few blocks around German train stations, there are generally a number of reasonably priced hotels, like well-established chains such as IBIS, Holiday Inn, and the Raddison Inn providing a clean, comfortable room. While many backpackers skip the Eurail pass in favor of low budget airlines for travel, hostels remain the housing of choice and can be found across the country in the major cities. Reserving online in advance is recommended. When the budget is not an issue, opulent five-star luxury resorts like the Kempinski Hotel Atlantic in Hamburg, and boutique hotels in the countryside like the Alle Hotel near Bavaria, cater to guests for hundreds of Euros a night. For visitors seeking more unusual lodging options beyond hotels, Germany hosts an array of unique stays, from sleeping in a lighthouse, snoozing inside an igloo or bunking down within a medieval castle. 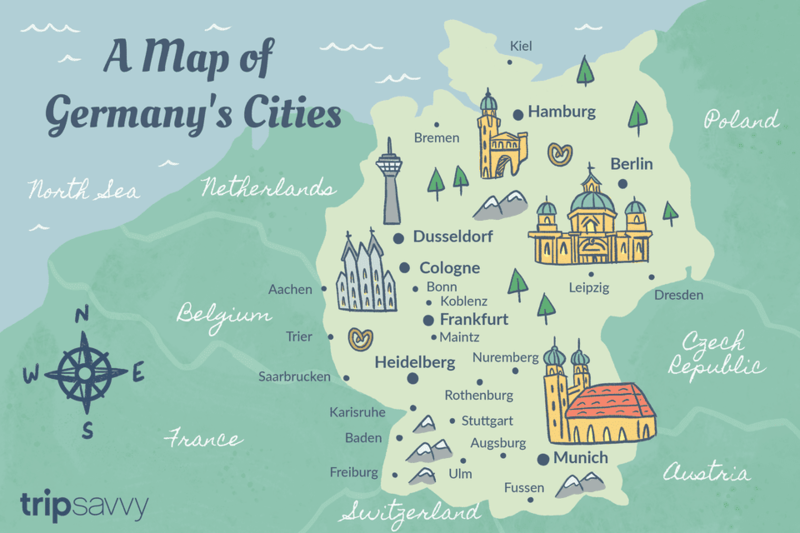 For first time travelers, the two most visited German cities are Berlin and Munich but there are many hidden gems throughout the country. Berlin is a vibrant art city, buzzing with energy and loaded with interesting museums—and it's still a bit of a bargain for European travelers. Munich is in the heart of Bavaria; it's a city centered in a beautiful rural area, full of tradition. Munich exemplifies what foreigners are likely to think of when picturing a trip to Germany, surrounded by lush greenery, grand medieval castles, and historic streets showcasing classic baroque architecture. While Bavaria is probably the most well-known of Germany's States or "regions", Baden Wurttemberg, in the southwest corner, has gained popularity as it is home to Lake Constance, as well as Karlsruhe, the "gateway to the Black Forest." The Castle Road passes directly through, and there are plenty of wine towns like Freiburg. Everyone's favorite medieval village, Rothenburg ob der Tauber is just outside the boundary of Baden Wurttemberg in a corner of Bavaria. Many of Europe's finest automobiles are designed and built in Germany, so car lovers will find multiple museums to explore the history and latest innovations in the industry. You can also head out to a unique race track that doubles as an autobahn to test your driving skills behind the wheel. Germany is crisscrossed by numerous cycling trails and it's easy to get around on a bike in the major cities. There is an even a bike Autobahn that will eventually stretch 62 miles and connect 10 different Germany cities. If visiting the country in the fall, put on your finest Lederhosen or Dirndl and stop in Munich for the annual Octoberfest festival. Sausage or bratwurst is the unofficial dish of Germany but meal offerings will appeal to almost any palate with dumplings, spätzle, pasta and potato options as the standard fare in almost every traditional restaurant. For those that abstain from alcohol, tea and juices are a menu staple but expect to be always be offered a tall stein of locally produced beer by your server. While service is included in the bill, generally waiters are generally tipped 5-10 percent for good service.